European elections and climate protests provide the papers with plenty to talk about on Thursday. The latest on Brexit and Theresa May’s future as Prime Minister make headlines on Monday, while many front pages feature pictures of Masters winner Tiger Woods. 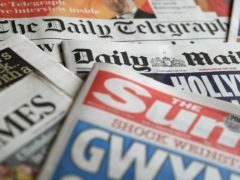 Brexit appears to take a backseat in Saturday’s papers with the latest on Julian Assange and a fine for a parenting club making headlines. Brexit features on many of the front pages at the end of the working week, after Theresa May was granted an extension to Britain’s departure from the European Union. Brexit remains on the fronts of many papers on Thursday after the Prime Minister requested an extension to the Article 50 period, calling it a “matter of personal regret”. The “crisis” facing the country over the expected delay to Brexit leads most papers on Wednesday. Brexit and the Ethiopian Airlines crash are top of the agenda for Monday’s papers. Three MPs defecting from the Conservative party make headlines in Thursday’s papers after Anna Soubry, Heidi Allen and Sarah Wollaston joined The Independent Group. The latest twists and turns in the story of runaway Shamima Begum make headlines on Wednesday, alongside tales about another Labour MP resigning from the party and the death of designer Karl Lagerfeld. Royal bananas, screen time, organ donation and – of course – Brexit are on Saturday’ front pages. Brexit takes a back seat in most of Thursday’s papers as stories about knife crime, Facebook and the NHS make headlines. As Theresa May heads to the Commons to update MPs on her Brexit plans, the issue leads several of the papers.